4 Bedroom Detached House For Sale in Horsham for Guide Price £1,950,000. EQUESTRIAN - Northlands Farm is a Grade II listed country house of significant character, displaying many period features including exposed wall and ceiling timbers and a fine inglenook fireplace in the dining room. All rooms are well proportioned and throughout the ceilings are of a good height for the age and style of the property. The attractive elevations are brick, tile hung to the first floor with some period lattice paned windows under a clay tiles roof. Opening from the entrance hall are 3 receptions rooms including an elegant sitting room, beamed dining room with an impressive inglenook fireplace and a study. The large farmhouse style kitchen has a 4 oven Aga. On the first floor are 4 bedrooms and 3 bath/shower rooms including 2 suites. From the landing a staircase rises to a large loft, part of which could be adapted to provide an additional bedroom subject to planning. Set to one side is a detached 2/3 bedroom cottage providing excellent relatives’/guest accommodation and which has its own private area of garden. 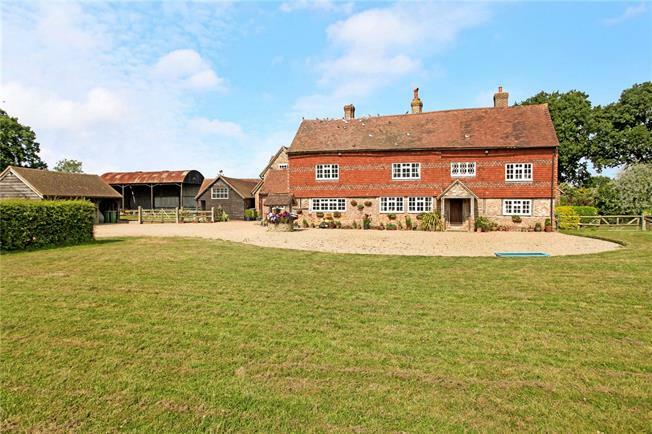 Northlands Farm is situated in an outstanding rural position, approached by a country lane and set close to the Surrey/West Sussex border about 3 miles to the north of Horsham. Horsham provides excellent shopping and leisure facilities together with a mainline rail service to London (Victoria and London Bridge). Horsham by-pass links with the M23 providing access to Gatwick Airport, the M25 and the national motorway network. Within the area there is a variety of sporting and recreational facilities including golf at Rusper, Cottesmore Park, Horsham and Slinfold, show jumping at Hickstead, polo at Cowdray Park and over the surrounding countryside there are many miles of beautiful walks and rides. There is an excellent choice of both private and state schools including Handcross Park, Farlington, Pennthorpe and Cranleigh. There are mainline rail services from Three Bridges and the Gatwick Express. The property is ideally situated for purchasers seeking a rural country house close to the Surrey/Sussex border yet within easy reach of facilities and communications. From the lane double gates open onto a gravel drive providing extensive parking to the front of the house and the outbuildings. To one side is a triple bay open fronted garage and a chicken house set in an enclosure. 5 bar gates open to the stable yard with an L-shaped range of stables with a tack room and cloakroom. Beyond is a 3 bay Dutch barn, open frontage storage barn and a garage. A formal area of garden adjoins the house on the west side and comprises stone terraces and paths, lawns, herbaceous beds and numerous mature shrubs and trees. Set within the garden is the swimming pool with a broad stone surround. Kitchen garden with raised beds and a greenhouse. Beyond the formal areas of garden the land extends to the north, west and south providing a high degree of privacy and protection and comprises mainly of pasture, bordered by mature hedging and a small area of woodland with a pond. In all the land extends to about 38 acres. In all about 38 acres.